Pivoting is a buzzword in the entrepreneurial community, mainly because it represents core start-up ideologies such as risk and adaption. Some tweaks are done in order to push a business to the next level, others to escape falling into a dangerous situation or to keep up with the latest trends and not miss an opportunity when it is within one's grasp. In India's fast-paced e-commerce sector, we witness these all the time as companies re-invent their strategies and operations to future-proof growth. Techcircle.in looks at five such companies which have gone through a makeover and gives you the low-down on how and why they have done it. Exclusively.in: Exclusively.in started as a website that sold Indian fashion, jewellery, handbags, craft items, paintings, designer ware and wedding attires to the Indian diaspora across the globe. It had also raised $16 million from Tiger Global, Accel Partners and Helion Ventures in May this year. In October, however, the company announced that it would be no longer a private, flash sales site and would become an online mall. Incidentally, private club sites such as BagitToday, 99Labels, Brandmile, Theprivatesales, Naaptol Club and Fashionandyou require customers to have an invitation before they can start shopping. These sites also follow the flash sales model, offering high discounts for a short period of time every day. But the private club, flash sales model or 'private sales' business model faces several challenges including unsold inventory, shipping issues, sluggish sales and poor customer care. Sunjay Guleria, CEO of Exclusively.in, explained the transition, "We saw the future of sales shifting â€“ from members-only to an open site due to an overwhelming demand for our products that short-lived flash sales could not meet. We felt the best way to service that demand was to move away from a consignment model in order to provide fully curated collections with a much broader selection and a full range of sizing to a wider consumer base." Taggle: Although it was one of the earliest group buying start-ups in India, Bangalore-based Taggle Internet Ventures is now a straggler in the e-commerce race. The site was announced earlier this year but, around mid-2011, it gave up the group buying model to become a generic e-com site. Now, deals related to services such as spas and restaurants have been pushed to a separate page called Taggle Plus. In July this year, Taggle founder John Kuruvilla told Techcircle.in that the changes on the website and the shifting of the service deals to Taggle Plus had been done to suit customers' requirements. "We have increased our product focus, based on customer demand," he said. Indiatimes Shopping: This is an 11-year-old e-commerce portal from Times Internet Ltd. From a demand aggregation model, where it asked suppliers to deliver goods from their warehouses, it has now taken more control of the delivery and the inventory of stocks. Also, it is no longer a marketplace like eBay. In August this year, it was relaunched as a horizontal e-commerce site, which is more customer-centric. The key focus is now on sourcing and merchandising, according to Gautam Sinha, CTO & e-commerce head of Times Internet. Indiatimes is also planning to set up vertical sub-sites for categories. Myntra: From selling personalised merchandise such as T-shirts and key chains to enterprises, colleges and individuals, Myntra.com has evolved into a lifestyle portal in 2009 and started offering apparel, shoes and accessories â€“ from casual and sports brands such as Nike and Lee. "Personalisation is a niche market and we decided that we should go mainstream," said Mukesh Bansal, co-founder and CEO of Myntra, when asked about the overhaul. Now the website has over 5 lakh users and is growing at a fast pace, aiming to reach $100 million by 2015. Sportswear, in particular, is very popular on the website. 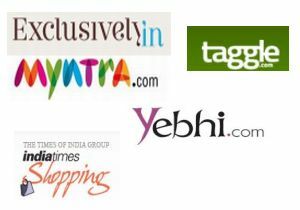 Yebhi: The previous avatar of Yebhi.com was BigShoeBazaar.com, which also sold apparel but was better known as a pioneer in selling shoes online in India. Sticking to the shoes vertical helped it rise fast, but in late 2010, the company was rebranded as an online fashion departmental store and Yebhi.com came into being. Offering a glance at how things have changed at the firm after rebranding, Yebhi.com co-founder Manmohan Agarwal, said, "We started BigShoeBazaar.com with an average of 5 orders a day. After repositioning ourselves as a multi-category brand store, we get an order in less than a minute. That's the current order rate." The site now offers some 150 apparel and accessories brands, and also sells gift items such as mugs and glasses, bar dÃ©cor and stationery. While these five sites have undergone a clear change in their business models, other e-commerce start-ups in the country have changed their modus operandi by making new investments in technology and logistics as they evolve. Also, many have expanded into new category verticals. Such e-commerce evolution is all too apparent when one considers Flipkart or Infibeam. Initially, both focused on book e-tailing (online book retailing), but later evolved into full-fledged e- commerce sites, selling everything from handsets and gaming consoles to toasters, vacuum cleaners and cameras. India's top deal site Snapdeal.com, as well as most of the daily deal sites, stretched to offer deals on services such as spas, gyms and movies, to lifestyle products and consumer electronics such as watches, bags and handsets, which are in demand. Then there are sites like Buzzintown.com, which is an events and entertainment portal that adds deals as a sub-site. Many such start-ups have hopped aboard the deals bandwagon and adopted new business models, to keep pace with the changing trends in the e-commerce industry.